Honors & Awards Honorary Memb. The Tsuboi Award was established in 1991 with the help of a donation from the late Mrs. Kazuko Tsuboi. 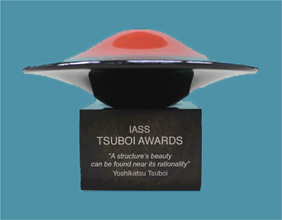 This award honors the memory of Professor Yoshikatsu Tsuboi (Japan, 1907-1990), former President and Honorary Member of the IASS, and his outstanding contributions to structural and architectural design. (A) For the most meritorious paper published in the Journal of the IASS in the preceding calendar year. (B) For the most outstanding paper presented and published in the Proceedings of the previous year's annual IASS Symposium. Each award consists of a Japanese lacquerware sculpture with an appropriate engraved plaque attached to its base. The sculpture was designed by Hiroko Hatekenaka and Ryohei Miyata, and the awards are handcrafted by Takuji Ogimura, with important contributions to the design and fabrication efforts by Yoshiaki Tsuboi, the son of Professor Tsuboi. 1991 M. Balz (Germany): "Architectural Aspects of Organic Forms and Design of Concrete Shells"
1992 M. Kawaguchi and M. Abe (Japan): "Design and Construction of Sant Jordi Sports Palace: A Venue for Barcelona Olympics"
H. Isler (Switzerland): "Generating Shell Shapes by Experiments"
M. Levy (USA): "The Innovation of Lightness"
M.E. Giuliani (Italy): Innovative Composite Spatial Structures for the New Milano Fair Exhibition Facilities"
B.F. Sparling, B.W. Smith and A.G. Davenport (United Kingdom): "Simplified Dynamic Analysis Methods for Guyed Masts in Turbulent Winds"
1997 B. Maurin, R. Motro (France): "Investigation of Minimal Forms with Density Methods"
1998 H. Ohmori and K. Yamamoto (Japan): "Shape Optimization of Shell and Spatial Structures for Specified Stress Distribution"
1999 P. Huybers (The Netherlands): "The Chiral Polyhedra"
2000 C. Otero, V. Gil and J. I. Alvaro (Spain): "CR-Tangent Meshes"
2002 T. Kokawa (Japan): "Field Study of a 30-M Span Ice Dome"
2003 C. Cui, H. Ohmori and M. Sasaki (Japan): "Computational Morphogenesis of 3D Structures by Extended ESO Method"
T. Aihara, M. Katov, N. Itagaki, M. Mitsui and K. Ito (Japan): "A Hybrid Structure Consisting of a Steel Beam String Structure and a Wooden Hyperbolic Paraboloidal Shell"
2005 O. Soykasap, A.M. Watt and S. Pellegrino (UK): "New Concept for Ultra-Thin Deployable Structures"
C. Douthe, O. Baverel and J.F. Caron (France): "Form-Finding of a Grid Shell in Composite Materials"
2008 B. Maurin, R. Motro, V. Raducanu and N. Pauli (France): "Soft `Tensegrity Like´ Panel: Conceptual Design and Form Finding"
2009 A. Steinboeck, G. Hoefinger, X. Jia and H.A. Mang (Austria): "Three Pending Questions in Structural Stability"
2010 P. Casinello and J.A. Torroja (Spain): "Félix Candela: His Vocational Training at the University and his Subsequent Relationship with the Institute Founded by Eduardo Torroja"
2011 F. Escrig (Spain): "Geometry and Structures: Historical Impressions about Architecture"
2012 T. Tachi and K. Miura (Japan): "Rigid-Foldable Cylinders and Cells"
2013 D.S. Hensel and G.B. Bover (Norway): "Nested Catenaries"
2015 J. Lienhard and J. Knippers: "Bending-Active Textile Hybrids"
2016 J. Abramczyk (Poland): "Integrated Building Forms Covered with Effectively Transformed Folded Sheets"
2017 K. Roovers and N. De Temmerman (Belgium): 'Geometric Design of Deployable Scissor Grids Consisting of Generalized Polar Units"
1991 E. Ramm (Germany): "Shape Finding Methods in Shells"
1992 M. C. Allen (Canada): "Toronto Sky Dome Roof Structure: Engineering Challenge"
1993 G. Groci and A. Visicovic (Italy): "Causes of the Failure of Coliseums over the Centuries, and Evaluation of Safety Levels"
1994 J. Schlaich and H. Schober (Germany): "Glass-Covered Lightweight Spatial Structures"
1995 F. Escrig, J.P. Valcarcel and J. Sanchez (Spain): "Deployable Structures Squared in Plan: Design and Construction"
1997 K. Ishii (Japan): "Membranes Structures in Japan: Technologies for Supporting Membrane Structures"
1998 Y. Hangai (Japan): "Buckling Analysis of Stress Unilateral Structural Systems"
1999 N. Imagawa (Japan): "Shells and Spatial Structures: From Recent Past to the Millennium"
2000 G. Croci (Italy): "The Restoration of the Basilica of Francis of Assisi"
T. Tarnai (Hungary): "Origami in Structural Engineering"
M. Uchikoshi, S. Kato, S. Nakazawa and Y. Mukaiyama (Japan): "How Do We Realize a Super Large Dome Under Severest Earthquake? : A Dome with Seismic Isolation System"
2002 M. Bechtholt (USA): "Wood-foam Sandwich Shells: Computer-Aided Manufacturing of Complex Shapes"
2003 M. M. Sheu, J. H. Jong, C. C. Chang, C. H. Chou and L. C. Ting (Taiwan): "Design and Failure of High-Rise Building Structures in Taiwan"
2004 F. V. Jensen and S. Pellegrino (United Kingdom): "Expandable Blob Structures"
2005 Y.Ookouchi, T.Takeuchi, T.Uchiyama, K.Suzuki, T.Sugiyama, T.Ogawa and S. Kato (Japan): "Experimental Studies of Tower Structures with Hysteretic Dampers"
2006 A. Smaili and R. Motro (France): "Folding and Unfolding of Curved Tensegrity Systems by Finite Mechanism Activation"
2007 P. Winslow, S. Pellegrino and S.B. Sharma (UK): "Mapping Two-Way Grids on to Free-Form Surface"
2009 Michael H. Ramage, John A. Ochsendorf, Peter Rich (UK/USA/South Africa): "Sustainable Shells: New African Vaults Built with Soil-Cement Tiles". 2010 T. Van Mele and P. Block (Switzerland): "A Novel Form Finding Method for Fabric Formwork for Concrete Shells"
2011 F. Dieringer, R. Wüchner, and K.U. Bletzinger (Germany): "Practical advances in numerical form finding and cutting pattern generation for membrane structures"
2012 S. Neuhaeuser, M. Weickgenannt, C. Witte, W. Haase. O. Sawodny and W. Sobek (Germany): "Stuttgart Smart Shell - A Full Scale Prototype of an Adaptative Shell Structure"
2013 P. Eisenbach, R. Vasudevan, M. Grohmann, K. Bollinger and S. Hauser (Germany): "Parapluie - Ultra Thin Concrete Shell Made of UHPC Activating Membrane Effects"
2014 E.M. Segal, L. Rhode-Barbarigos, F. Coelho, S. Adriaenssens (USA): "An Automated Robust Design Methodology for Suspended Structures"
2015 K-M. M. Tam, J.R. Coleman, N.W. Fine, C.T. Mueller (USA): "Stress Line Additive Manufacturing (SLAM) for 2.5-D Shells"
2016 K. Noda, Y. Kanebako (Japan): "Structural Design of a Building with Shell and Flat Slab Hybrids"
2017 C Hartz, A Mazurek, M. Miki, T Zegard, T. Mitchell and W.F. Baker (USA): "The Application of 2D and 3D Graphic Statics in Design"